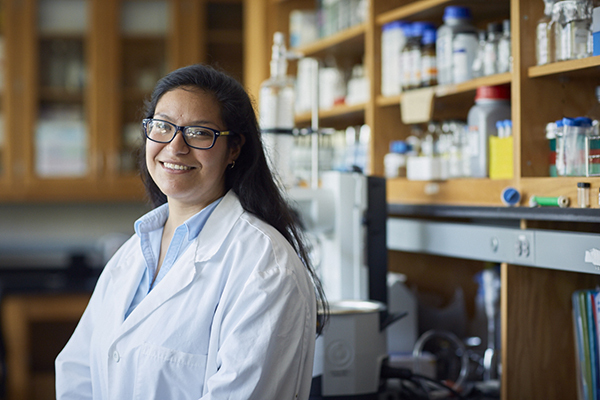 Sonia Alcantar graduated from UNG in December 2016 and began an internship at Pacific Northwest National Laboratory in the spring. Recent University of North Georgia (UNG) graduates Katie McCullough, Kimberly Wright and Sonia Alcantar were awarded internships with the U.S. Department of Energy (DOE) to study at the Los Alamos National Laboratory in Los Alamos, New Mexico and the Pacific Northwest National Laboratory (PNNL) in Richland, Washington. As part of the DOE, a cabinet-level department of the national government that oversees policies regarding energy and safety on nuclear material, the Science Undergraduate Laboratory Internship (SULI) provides research experience at DOE laboratories to college students on current programs or ones chosen by the intern. SULI interns are provided a salary for their work in the laboratories as well as expenses during their stay. Each intern receives $500 per 40-hour workweek for the duration of the 16-week program. "The DOE SULI program is very competitive and highly respected. I am exceedingly proud of the hard work these students have put into their undergraduate research over the years. They have clearly received impeccable mentorship from many in the biology department," said Dr. Anastasia Lin, assistant dean of research and scholarship at UNG. With a major in biology and a minor in chemistry, McCullough began her research in bio-ecology during a UNG study abroad tropical reef ecology course in Belize and where she worked alongside Dr. Nancy Dalman, head of the Department of Biology, and Jill Schulze, assistant dean of the College of Science & Mathematics. "In Belize we studied parrotfish. Afterwards my student group presented our findings at several conferences and ultimately received a UNG Faculty-Undergraduate Summer Engagement (FUSE) grant to continue our research," McCullough said. Alcantar, one of four children, is the first member of her family to graduate from a university. She has been involved with undergraduate research since her sophomore year, and graduated in December 2016 with a Bachelor of Science in biology. "In addition to the spring 2017 SULI opportunity at PNNL, I was also selected as an intern for summer 2017," Alcantar said. "My current research is being conducted in a boreal peatland forest in northern Minnesota made up of black spruce. There are multiple sections which are "encased" by their own individual greenhouses which allow the scientist to control the environment, specifically that of the temperature and atmospheric carbon dioxide concentrations, which vary by location." Wright also graduated in December 2016 with a Bachelor of Science in biology. During the internship, she is working to engineer microorganisms, particularly algae, to improve their feasibility as feedstock for the production of biofuels. "I've done mostly microbiology in the past, so I chose Los Alamos National Laboratory as my top choice — I wasn't expecting to get picked for the program, let alone receive my first choice. So far, the experience has been great, and has helped me solidify my decision to go to graduate school. I've learned and done a lot of different things in just the one month that I've been here, and I’m looking forward to the rest of my time here," Wright said.